Merry Christmas! Happy new year 2019! We are an art supplier in the line of handmade oil painting and giclee print ,with over ten years’ experience on designing, manufacturing and exporting. 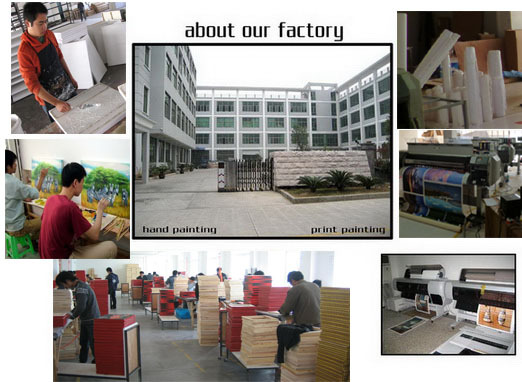 For this page,it’s for description of our Printing service. We have several Epson, MUTOH and HP printers, turning photos into canvas print;we are able to take 20*40'containers/per month. We have invested a lot in human, material and financial resources,we have complete system for printing,framing,packing,exporting,without middle-man, so that we are able to control the production time and quality lever as well the lowest cost. MOQ Per design per size 5pcs,total quantity should be 100pcs at least. A, Without frame: roll with tude, bubble film filling and wrap. B, With frame: 4corner protections and shrink wrap for each individual, then 8-10pieces into a carton. 1)Family room, living room, bedroom, dining room, children room, study, recreation room, etc. 2)Commercial space: hotels, restaurants, department stores, shopping malls, exhibition halls etc. Full online catalogues,please click here. Copyright © 2006-2019 paintingpainting.com, All Rights Reserved.